If you are tired of all the clutter on his night stand or dresser, this valet is the perfect solution to clean up the mess. Our men's jewelry valet will hold and organize all his stuff when he empties out his pockets. 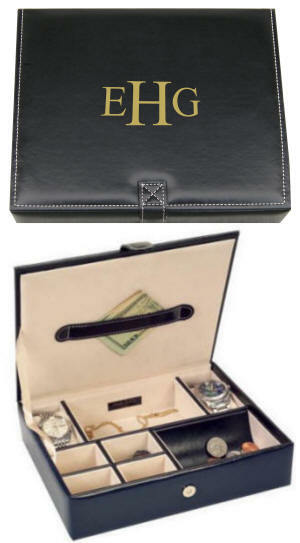 All his personal effects can be placed in one handsomely designed box. Made of black faux leather with white top stitching, this valet has places for storage of money, coins, two padded watch cushions, four small separate compartments, and one large compartment. The box is hand lined with sueded fabric and has a front snap closure. We will personalize the valet to create a handsome personalized gift that will look fabulous on his nightstand or dresser.